To distract me from all the knitting and writing I am supposed to be doing I decided to sort my button collection. A month or so ago I bought a large box of buttons from a woman who was selling her mother's odds and ends. I figured this was a good time to sort through all of those I've bought over the years primarily from Dusty's Vintage Buttons (if she has a booth at a show, definitely visit). The photos represent the tip of the iceberg. The first box is a SMALL part of my mother of pearl buttons and the others are bakelite. I've got quite a few boxes and many more to go. I've reviewed quite a few lessons and received many course orders. It seems a lot of knitters plan on working on their skills over the spring. Again, what I've been seeing in the lessons has prompted this discussion. I've reviewed many lessons where the knitters' overall tension is very nice but there is a problem at the sides only. This is a different issue that the entry I made last year about ugly selvedge stitches (link). This tension issue is where the stitches next to the selvedge stitches vary in size. It is very unattractive particularly if the edge is to be seamed or is next to a band. I've been working with non-wool fibers for the Summer 2019 issue and it is more of an issue with inelastic fibers. 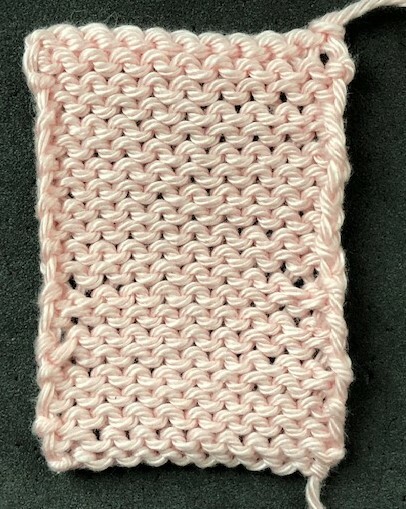 In the sample below, worked in 100% cotton, the lower part of the swatch shows what this issue looks like. The first photo is the RS and the next photo is the WS. Note the gutters at the bottom of the swatch. There is an easy fix you can try. For most knitters, if you tighten up at the beginning of every row and loosen up a bit at the end of every row, you will eliminate this problem. However, you must be careful when beginning the row. 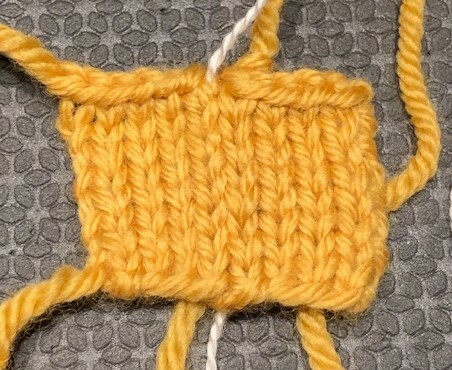 I've seen knitters who tighten up so much BEFORE beginning the row that all they do is draw the yarn from the previous row making those stitches even smaller. What I generally do is work the first two stitches normally and then work the next three stitches more tightly. When I get to the end of the row I use just the needle tips to work the last three or four stitches and I try not to slip them too far down the needle barrel. I was thinking of having Salon on Saturday but the Metropolitan Opera's simulcast is Die Walkure so I'll be at the theater for 5 1/2 hours. Salon will be on Sunday but I'm not sure of the time yet. 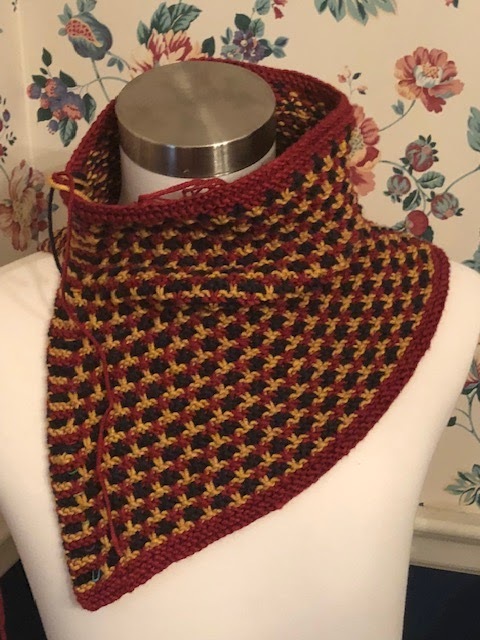 I finished up a few late Christmas gifts before starting on the Summer 2019 projects. I made a skirt and top set with 100% hemp. I can't say it was fun to kit but the drape on the skirt is amazing. Here is a closeup of the puntas edging. Next up was the Confident Beginner project which accompanies Binka Schwan's Skill Building article. This one was on double decreases worked on the RS and WS. I used the yarn left over from the Intarsia Top in the last issue. I found an interesting stitch pattern with a 5 row repeat which meant that the rows would alternate on the RS and WS when worked flat. It was perfect for the scarf. I used a provisional cast on so that I could work one side with CDD decreases and the other with S1k2tog psso decrease. The colors in the photo above are more accurate but here is what it looks like at the cast on. I've finished the baby sweater but I'm still working on the child size. Then I'm done. I apologize for not posting sooner but between travel, the holidays and the Spring issue of Cast On (see Current Projects) I haven't had much time. I have really been knitting like mad to make the deadline for the photo shoot. Quite a few people have signed up for the Basics course and several for the Finishing Course. I haven't received many lessons yet but I expect an uptick now that the holidays are finally OVER! I've had several students sent me links to videos show a new way to make neater SSK decreases. This new method (I'm not going to put links in for this method as they all omit one rather important detail) is fine for your own projects but if you are working on the Masters Program the results of this technique are not acceptable. 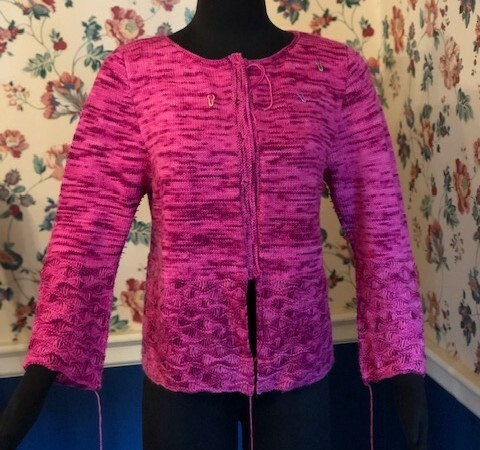 When you need to use mirrored decreases (to shape a neckline, for example) there is a problem. K2tog produces a neat, right slanting decrease. (It slants to the right since the stitch to the left is on top of the stitch to the right.) Left slanting decreases aren't quite so neat and tidy. 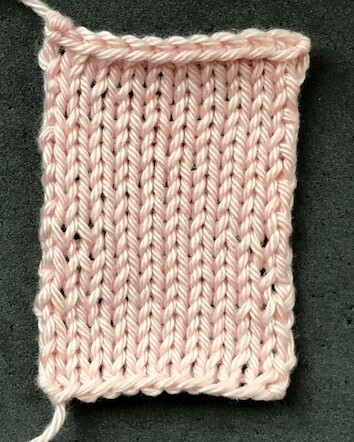 When I first started knitting, the preferred technique is the SKP (and this is still the preferred technique in Britain and Japan). Since just the first stitch is slipped and then passed over the second stitch, it often produces a very stretched out, large left slanting decrease (the stitch to the right is on top of the stitch to the left.) A big improvement on SKP is the SSK since two stitches are slipped, the decrease is smaller. How nice the SSK looks depends on your technique. If you use just your needle tips and really baby it, you can get a pretty good decrease. One improvement over this technique that my students suggest is slipping just the first stitch when working the SSK. Yes, this is does make the decrease slightly smaller but it twists the stitch to the left. For decreases to be fully mirrored, they have to be the same type of decrease, that is untwisted or twisted. 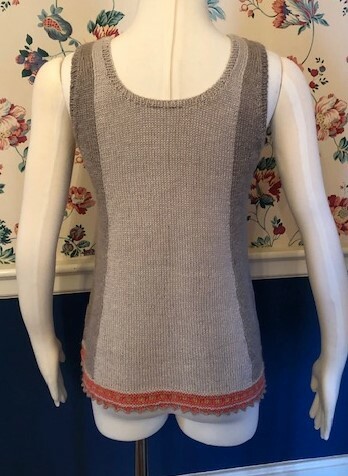 A newer version of the same decrease is making the rounds now where you insert the needle into the first stitch and then into the back of the next stitch and then pull the yarn through both. It produces the same result. None of the videos I've seen make mention of the twisted stitch. 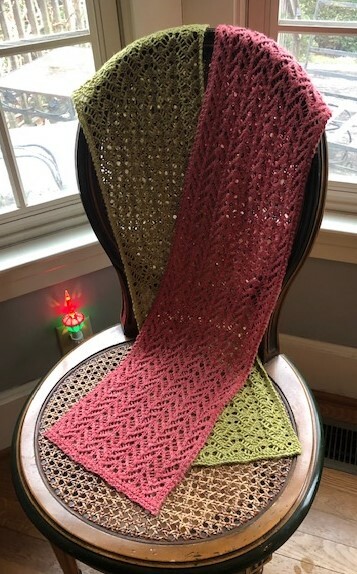 After teaching the Basics class for 10 years I have learned that many knitters cannot read their work and can't tell the difference until it is pointed out. 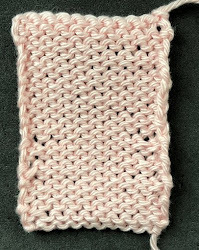 In the photo below I have worked a swatch using larger needles that I normally would. If you look at the left side, I have worked a series of K2tog decreases. On the right side I've worked SSK and variants so you can compare. First look at the K2tog decreases. 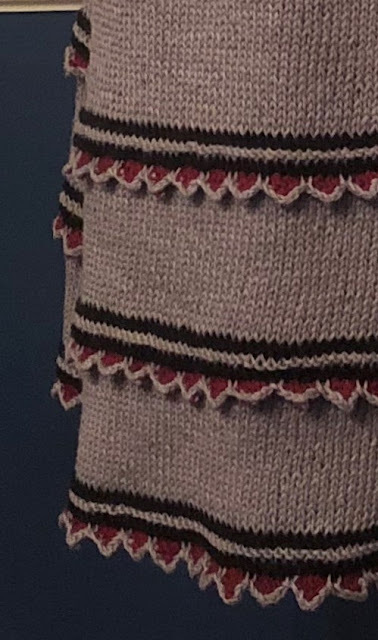 Notice that the stitch to the left is on top of the stitch to the right AND that stitch is open at the bottom, that is not twisted. That is what we are looking to match on the right side. Look at the decrease on the right side with a 1 to the left. I used just the standard technique for SSKs (which I demonstrate in the video) but I have used just my needle tips and really babied. I must say, it looks pretty good. When I worked the decrease labelled 2 I used a technique where on the row before the decrease row (the WS row) you wrap the stitches to be decreased the wrong way. This alters their orientation on the needle. When you slip the stitches for an SSK this is what you are doing so this technique skips that step. Since they aren't slipped, they are less stretched out. It looks pretty much the same as the SSK where I babied the stitches. Notice that the stitch to the left is open at the bottom and matches the K2tog. Now look at the decrease labelled 3 and notice that it stands out more than the others. The top stitch is twisted as well as the next stitch. This happens if you don't slip the stitches knitwise before making the decrease. 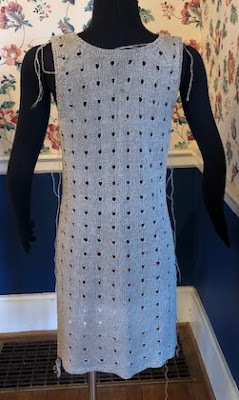 Twisted stitches are tighter than regular stitches and have a different gauge which is why you generally avoid them unless you are working Bavarian patterns or come lace patterns. The decreases labelled 4 and 5 use the techniques I mentioned above. 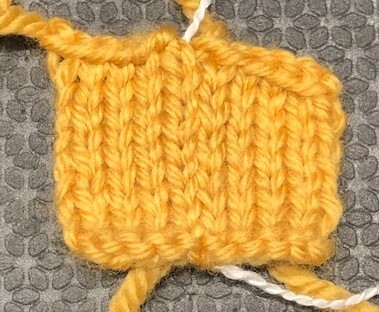 The second stitches are twisted. If you look closely you can see that they do not match their counterparts on the opposite side of the swatch. 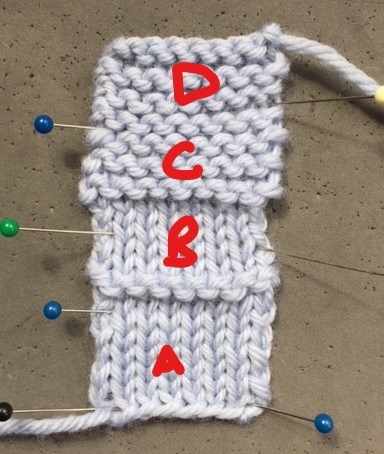 In the photo below I've placed arrows below the second stitches so you can see the twisted stitches and compare them. This video demonstrates all of the techniques I've discussed here. Salon will be today from 2-4 pm. Despite my laziness in not posting I have had salon most every weekend. Hopefully those coming today will help me get rid of all of the lovely chocolates left over from the holidays! My holiday knitting never got done, or even started! We start working on the Spring issue in November and it is ALWAYS a problem getting designs for this issue. Knitters do not want to commit to extra knitting over the holidays (even when I try and guilt them into it!) What seems to happen every year is I wind up taking on more that I'd like so I have been knitting like a mad person to get these things done. The worst part is that I've put off writing the patterns so the week after the photo shoot will be a horror show! Not shown is a pair of knee high socks. I'll photo them in my next entry along with (hopefully) very belated Christmas gifts. This one is a cover up. I envision it being worn over yoga clothes. 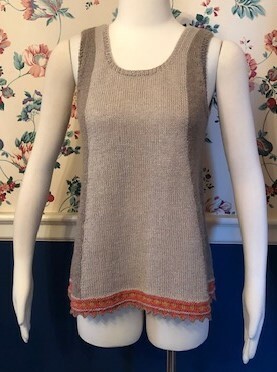 I loved Leslie's article on Puntas so I designed this top to use the intarsia technique but added the bottom border. Puntas are really fun. I plan to use them again. This is the Confident Beginner garment to accompany the Skill Building article on WS decreases. That lace at the bottom doesn't have any plain rows. I love it. Thank you Barbara Walker. I apologize for not posting sooner...a confluence of travel and getting Cast On out. 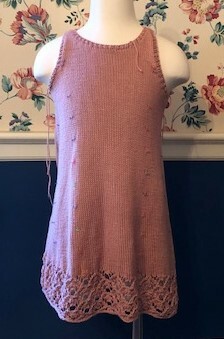 At the end of September I taught at the What the Knit! Retreat in Three Rivers, CA. This is Suzanne Bryan's guild and Binka and Charles were there as well. It was a wonderful weekend. The retreat center was very peaceful (code for no cell service) and my students were fabulous. Halloween was last week. Jan brought a present for George. You can tell he isn't thrilled. 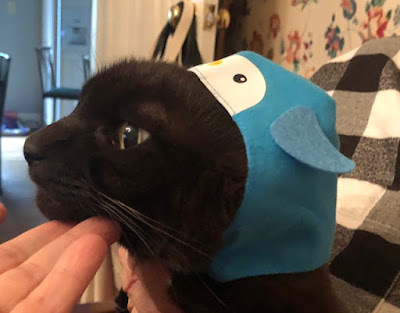 It is a fish hat. I'm thrilled that several students have completed the Finishing Course. It is a very comprehensive course and, to be truthful, a bit of a slog. I'm impressed. For the Winter issue of Cast On we included quite a few quick knits. 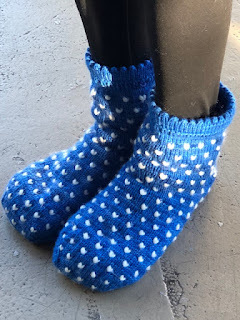 I did a pair of thrummed socks. They are a quick knit since I used Medium weight yarn. Working thrums isn't hard but it does require advanced preparation and a bit of patience. 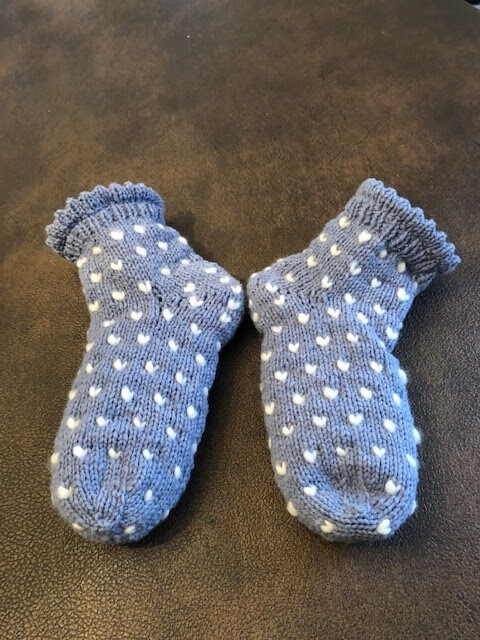 Here is a photo of the booties. The thrums are pieces of roving knit along with the working yarn. I'm not a spinner so I don't have roving on hand but most yarn stores do carry some and if not you can get it from KnitPicks. 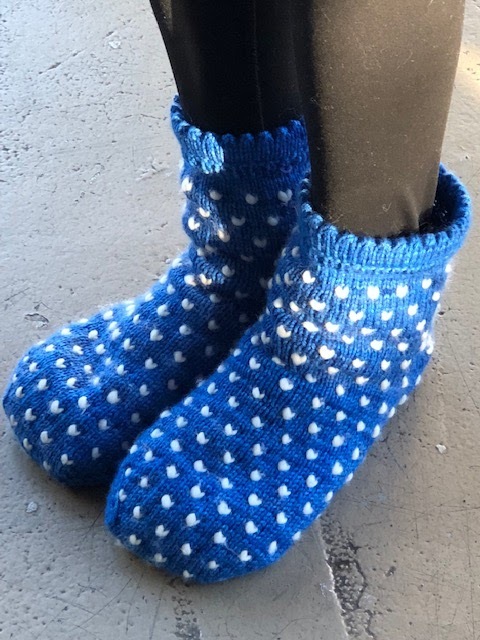 You can see in the photo above that the thrums line the inside to make the booties extra warm. Making the thrums isn't hard. Pull off a piece of roving about 5-6" long, stripping off sections to make it thinner. Fold it in thirds or fourths and you are ready to go. If you are member of TKGA, you might want to look at this past article by Heather Storta (Thrums) You have to sign in to see the article. I've seen two methods work working the thrums. In the first you work just the thrum and strand the working yarn behind it. The problem with this method is that if the thrum pulls free it is a dropped stitch. In the other method, you knit the yarn and the thrum together. The problem with this is that on the next round or row, you have to work the thrum through the back loop which can be a pain. I'm actually posting this after salon (it has been a rough week) so unless something drastic happens, Salon will be next Sunday from 1:30-3:20. 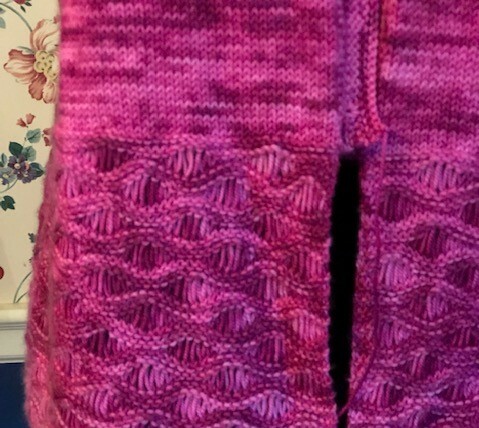 Looking back at my previous post it looks like I was working on the Wasp Wing Cardigan. I finished it as well as everything else I did for the magazine. 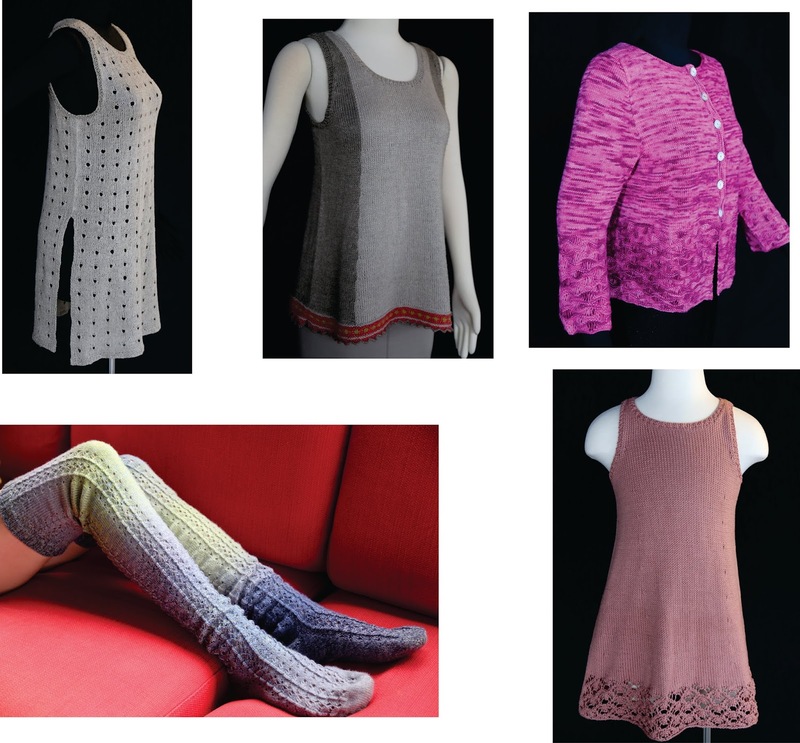 I did several things as quick knits. 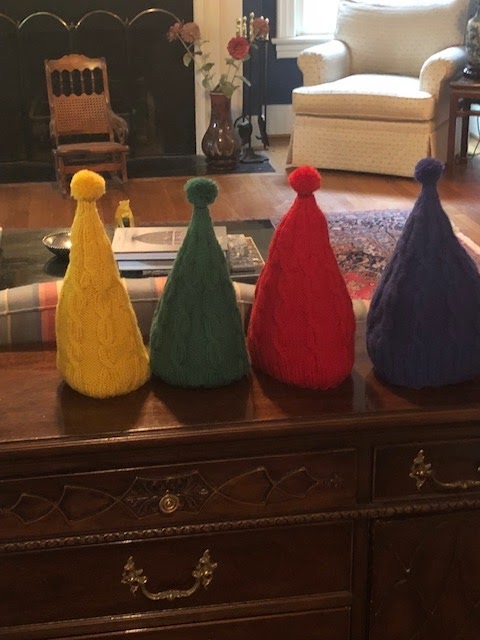 The gnome hats were so quick I knit four of them with the Universal Deluxe Worsted left over from the intarsia sweaters. And here are the booties. I used Pokeberry Station Worsted. I've been traveling quite a bit so I've haven't posted in a while. The new George continues to improve. He is so affectionate now. He doesn't want to let me out of his sight, particularly since I haven't been home. I've had lots of new students sign up for not only Basics but also Finishing and Swatch to Sweater. I've notice that this happens every fall. Just a reminder to my non-US students. I will hang onto your swatches until you complete the course. International postage is so expensive. I would have to raise the price of the course otherwise. I do include lots of photos of what I am talking about. I'm teaching at a retreat in California next weekend and one of the topics the students wanted covered was ugly selvedges. At first I thought they meant the tension issues that you can get in the stitches next to the selvedge. Nope. They meant the actual selvedge stitches. I've never worried about selvedge stitches. They are just ugly. 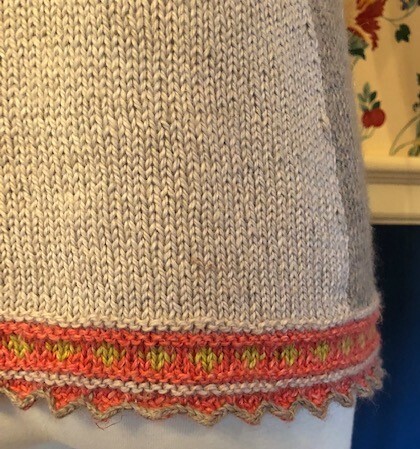 This is not a problem in projects which will be seamed or have bands since the selvedge stitch is hidden by the seam or the band. They provide the "seam allowance." Although they are ugly these stitches should be neat and tidy. If you look at the section marked A, notice that the selvedge stitches are a bit large. It really isn't a problem in this case since the size of the stitches next to the selvedges don't have a tension issue. If you look at the section marked B, notice that they are smaller. I accomplished this by making sure there was no excess yarn when I formed the next stitch. Ugly selvedge stitches in garter is a problem. If you look at the section marked C, notice that the selvedge stitches are larger and this detracts from the general appearance of the piece. Section D looks better as I took care to tighten up ever so slightly at the beginning of the row. The one thing you DO NOT want to do is to really pull the working yarn tight when making the first stitch. All this does is pull yarn from the previous row which causes a tension issue. So what do you do if your piece will not be seamed or have bands. You can use a special selvedge stitch. My favorite is to slip the first stitch. This creates an edge that looks exactly like the bind off. If you look at the photograph below you can see a problem immediately. There is a huge tension issue at the stitches next to the selvedge. It is better at the top of the swatch. I used a tapestry needle to shift the yarn in the larger stitches. I've met quite a few knitters who do this for all of their projects. I don't recommend it, particularly if the piece has a band. The loops at the selvedge each represent two rows. Yes, it is easier to pick up a band but the ratio will be all wrong and it will be puckered. Salon will be on Sunday from 2 to 4 pm. I finished up the second intarsia sweater in the other color palette. It is sized for children. I'm now working on the long cardigan. The back is finished and the fronts are blocking. 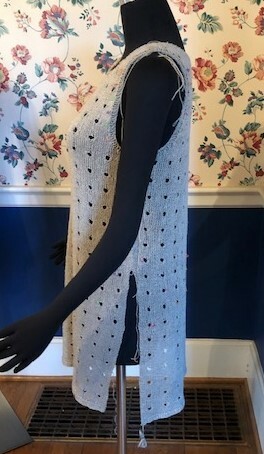 I absolutely love the fabric. It is Shibui Reed and Silk Cloud. 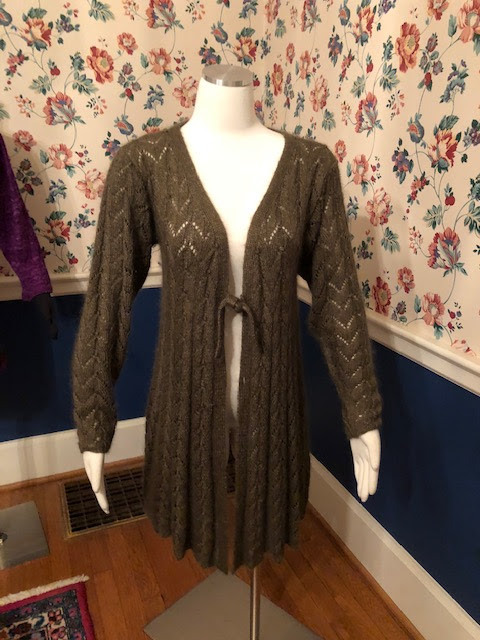 This sweater is a redo of one I did years ago but I've never been happy with the pattern. I've changed how the different sizes are worked. I also made it longer. I'll be able to post photos when I post again. I've been busy getting the Winter 2018 issue organized. August is a difficult month to try and order yarn. Between vacations and fiber festivals it can take quite a few emails to get the designers their yarn. I spent a lot of time sitting at my computer. We have 23 projects in the next issue. That is quite a bit of yarn! Some are still waiting for while someone (you know who you are, Carolyn) has already sent her project! I did take time to prepare my handouts for the retreat at the end of September. I'm teaching at Suzanne Bryan's guild's annual retreat. I'm looking forward to it as Charles Gandy is the other teacher and it will be wonderful to catch up with him. My students definitely are leading more exciting lives that me! I have received very few lessons to review. I know fall is approaching as more are signing up for classes. The minute the leaves start to fall we all think about our knitting! This week's tip was prompted by something the students at the retreat wanted covered. I'm always happy to customize what I teach. They wanted to know how to do a circular knitting join. I've already discussed this in a previous blog entry (Joining in the Round). What I didn't discuss in that entry was how to end a piece when knitting in the round. This photograph shows what a circular piece looks like when you bind off. When you work in the round there will always be a jog at the end which is quite unattractive. Before you cut the yarn and pull it through, you can knit into the first stitch and work another bind off stitch but it almost always leaves a bit of a hole. The best way to finish this requires a small bit of embroidery. Thread the yarn tail onto a tapestry needle and insert the needle under the two bind off loops of the first stitch. Then insert the needle into the center of the last bind off stitch. If you look at the photo below you can see that I've pulled the yarn fairly tight to match the size of the loops of the surrounding bind off stitches. Adjust the yarn tail so that the other loop matches. Here is the photo of the completed bind off. Salon will be on Sunday, August 26 from 2-4 pm. One of my favorite baristas at Starbucks recently had a baby girl. She has two sons. I wanted to make something for the baby but I wanted to make presents for the big brothers as well. I made a hat in a lovely pale pink from Spud & Chloe but I neglected to take a photo of it. Here is one of the brother hats. 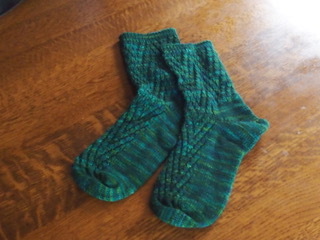 I used Berroco Ultra Alpaca for them. The photo shows it in progress where I have used dental elastics to mark decreases and cable crossing. Naturally I put small pompoms at the top as well. My friend Jan says they look like Gnome hats. I'm going to write the pattern up for the Winter issue as they are a very quick knit. I also finally got to Martha's birthday present. I forgot to photograph them as well but Martha kindly obliged. What the photo doesn't show is how wonderful this yarn is. I picked up a couple of skeins at the DFW Fiber Festival. It is a local dyer, A Thing for String, and it is a Yak blend. 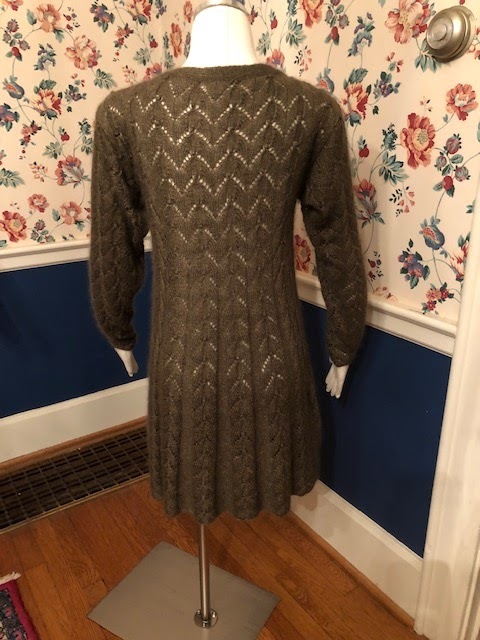 Donna Estin used the yarn for a sweater in the Fall Cast On. I've got another skein and I'm going to keep the socks for me. I signed on to doing the Stitch Anatomy lesson for the Winter issue. I can't say I like intarsia so I didn't want to do a complicated project. I came with this kid's sweater. This is the 12 month size. I did it in colors I like to describe as the Hudson Bay Blanket palette. I decided to do a larger size in a more subdued palette. This photo doesn't do the colors justice but the background is more of an oatmeal color. 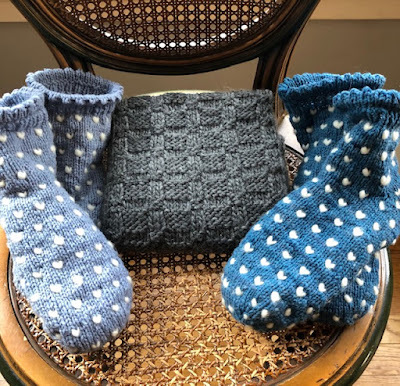 I choose Universal Deluxe Worsted as they have a lovely color selection and because Amy Gunderson is wonderful to work with. It seems like I order the yarn and it delivered the next day. Obviously I am going to have lots left over so I am going to use it for the Gnome hats. I got a package from Shibui two days ago. (Again, a wonderful company to work with). 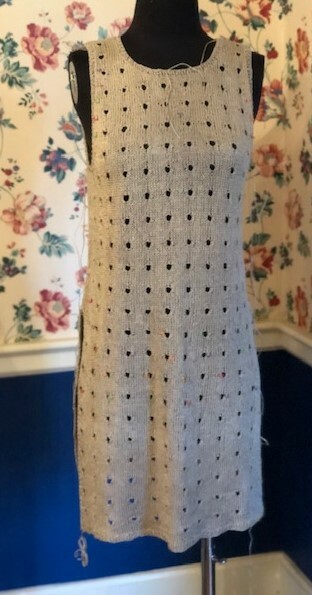 I'm going to redo a sweater I did back in 2009. 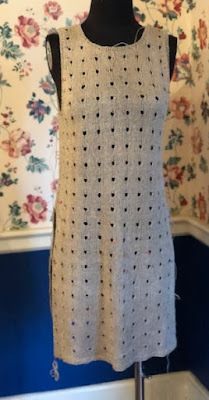 The yarn, Louet KidLin, has been discontinued so I'm going to use Shibui's Silk Cloud and Reed to get a similar effect. I'm going to make it longer as well. Since I've almost finished the intarsia sweater I'll swatch soon. I am horrified that it has been 2 months since my last post. My main excuse is shown under the section Current Projects. More about that later but TNNA and Cast On haven't helped. I haven't had a photo of George since my sweet Petipa has been gone. He is doing very well. In fact, he is a different cat. I guess he was meant to be an only child. I always thought he was food motivated. No, he was motivated to make Petipa miserable. He has lost a ton of weight and it isn't from grief. He is very self-satisfied. I've spent the past couple of weeks putting in 12-18 hour days on the Fall issue of Cast On. Sharon, the tech editor and I are the only staff and it is a lot of work. The photo shoot was two weeks ago and as soon as I get them, the magazine will go live. If you are a member, you will get an email when that happens. I used the time to put together indices for some of the regular features, primarily for those going through the Masters Program. If you are a member and if you are signed in these links will take you to the indices. There is a lot of good educational material there. Knitting 911 is a series by Binka Schwan that has instructions for fixing common mistakes. Finishing with Confidence is a series by me that covers all major topics in Finishing. The Fashion Framework and Stitch Anatomy series which began in 2009 discusses specific types of garments and individual stitch patterns. The On Your Way series is applicable to those doing the Masters Program or really anyone interested in improving their work. It has been VERY slow. Knitting has definitely taken a back seat to everything else! Things tend to pick up in the fall...not surprising! Something I see in lots of lessons have the same cause. 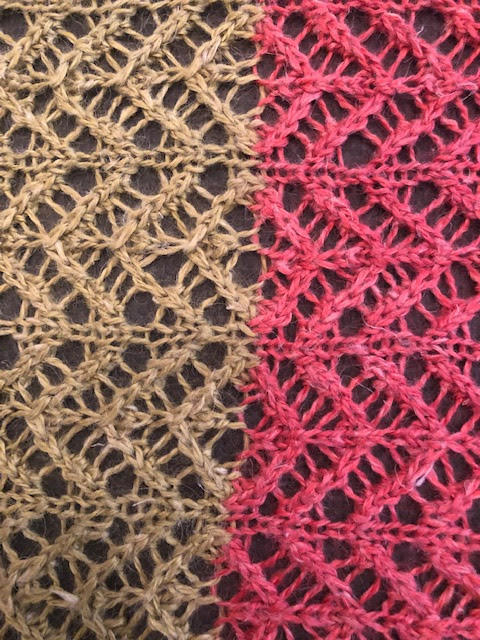 Ribbing, cables, seed stitch type of patterns all can be improved by a very simple thing. 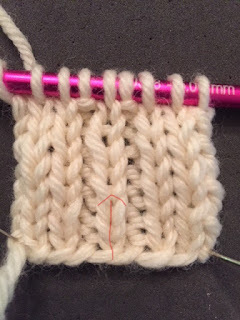 The next time you are working on a stitch pattern where you have knit and purl stitches together, look closely when you bring the yarn forward to make the purl. I think you will see that you don't bring the yarn completely forward. 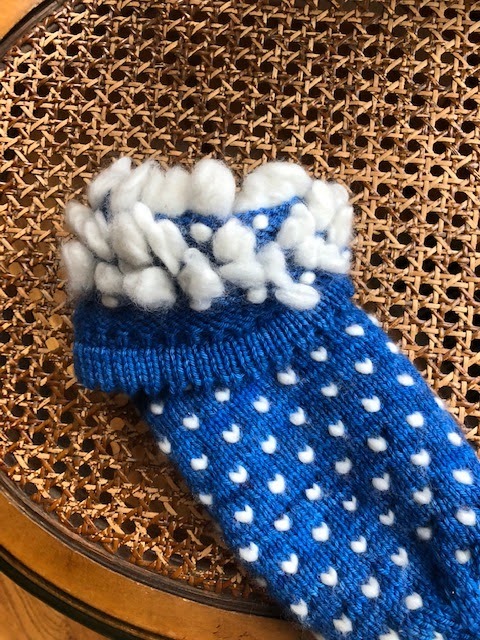 This excess yarn generally does one of two things...it works its way back into the previous knit stitch making it oversize or it leaves a ladder between the knit and purl. This causes K2P2 ribbing to look very sloppy where one column of stitches larger than the column to the right. It causes K1P1 ribbing to be overlarge (compare the size of the knit stitches in the ribbing to knit stitches above the ribbing and you will see what I mean. It causes ladders to the left of cables and seed stitch to look lacy rather than dense. In the photo below the ribbing isn't stretched. 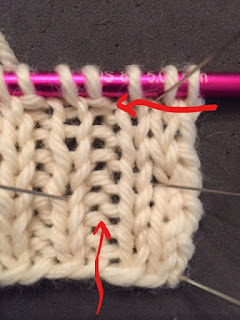 The arrow points to a column where the stitches are distorted due to the excess yarn. In the photo below the ribbing is stretched. The arrow at the bottom shows where the yarn was not brought completely forward. Notice the ladders on the right side of the purl column and that there are no ladders on the left side of the purl. It is easier to bring the yarn to the back when going from a purl to a knit. The arrow at the top shows two rows where the yarn was brought completely forward. No ladders. Here is a caveat. I was teaching and a student told me this did not work and demonstrated for me what she was doing. She was not bringing the yarn forward. She was yanking it forward and then giving another really hard pull. This just pulls the yarn from the previous stitches and causes an even bigger tension issue. In a lot of ways I am a lazy knitter. I hate having to change needles sizes because chances are I will forget to change back and I wind up having to rip out a few rows. I rarely drop down a size or two or ribbing. I get bring the yarn forward to eliminate the ladders. Guess what? Dropping down needle sizes doesn't get rid of ladders. It just makes them slightly shorted. I'm not sure I will be having Salon this weekend. I hope to be putting the finishing touches on the Fall issue. This sweater called Bird Lover totally took over my Summer. The gauge for 4" is 44 stitches. That was doable but ripping out 10" didn't help either. I did finish it two days before the photo shoot. The birds can be hard to see but they are there. They are easier to see in this closeup. 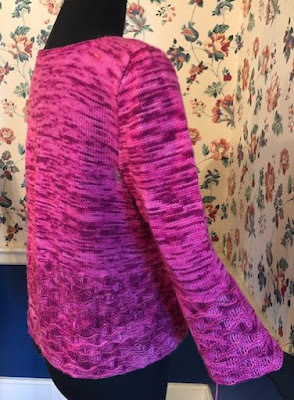 Of course I used RedFish Dyework yarns and as soon as I have uploaded the photographs to the magazine the sweater will go to them for the shows they will be doing. (I will be getting it back. 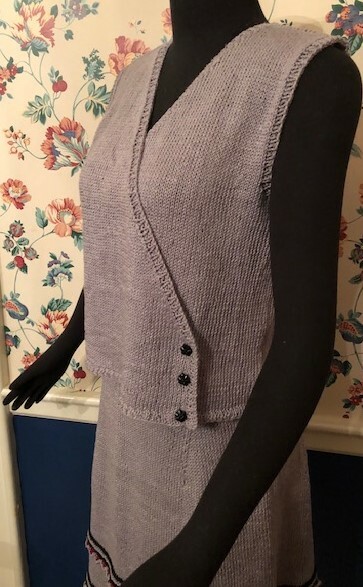 I just let these sweaters visit Elff and Sandy since they put together kits for the sweaters.) What these photos can't show is how soft and wonderful the drape of this stranded sweater. They are heavenly to wear. 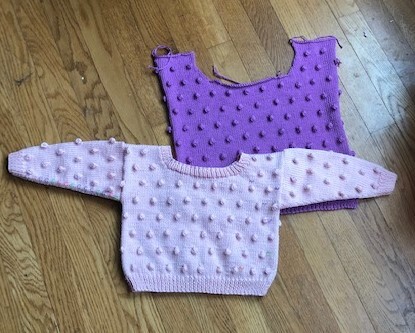 I did finish up the Big Boy sweater to match the baby one I did back in May. They turned out quite nice.